You never know when you're going to have good luck, but you can keep some readily in reserve with this cool new Insta-Luck - Authentic Four-Leaf Clover in a Bottle. 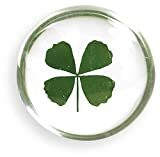 This 100% genuine four-leaf clover is hand-picked from true White Clovers (trifolium repens) grown in the USA, preserved through a proprietary 5-step method to prevent decay and maintain it's bright green color, and then placed in a tiny glass good luck jar for safekeeping. 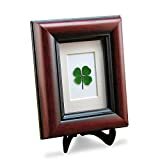 Since finding an authentic four-leaf clover is 1 in 10,000 and bad luck hovers around the 99% mark, this little investment in personal good fortune is sure to raise the odds in your favor.